In the archives, we have records dating all the way back to when White Ribbon Association was founded in 1876, then called the British Women’s Temperance Association (BWTA). But we have more than records in our collections; we also hold collections of different items, some of which date back almost as far. Amongst these items are our banners. If you wanted a banner today, you could get one pretty easily by finding a printing website and uploading your artwork. It would take you maybe half an hour and then you’d only need to wait for it to be delivered. The banners in our collection, by contrast, represent weeks or even months of work. They were painstakingly handcrafted by members of the organisation, or even by artists. The banners therefore tell us which messages or images were most important to White Ribboners in the past, which messages were thought vital enough to spend so much time and effort on. 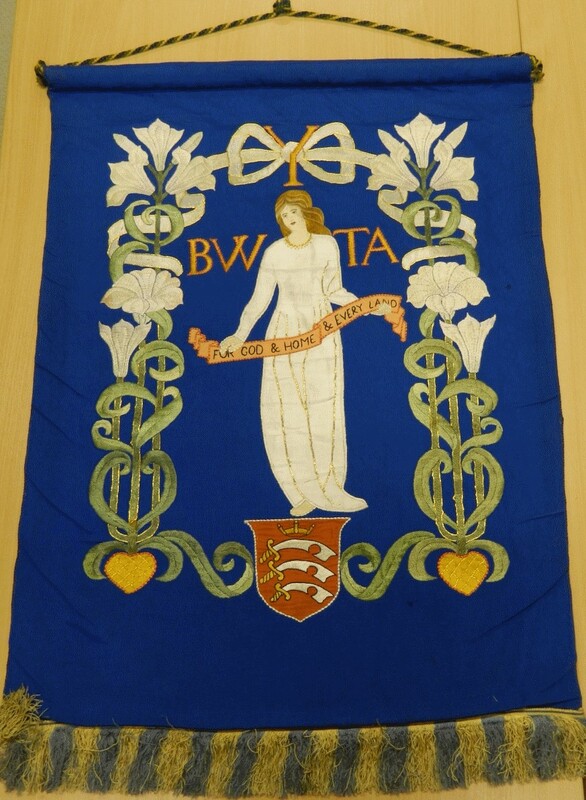 The text chosen for the banner tells us what message was most important to the BWTA – important enough to have embroidered onto gold silk! The slogan chosen (“we bind ourselves that others may be set free”) is typical of the Victorian era temperance movement, emphasising self-denial for the good of others – those tempted to drink, those harmed by the drinking of others and society at large. This contrasts with some later temperance messages which made alcohol into a universal evil and any drinking into a moral failing – a message that was perhaps harder to sell to the general public! 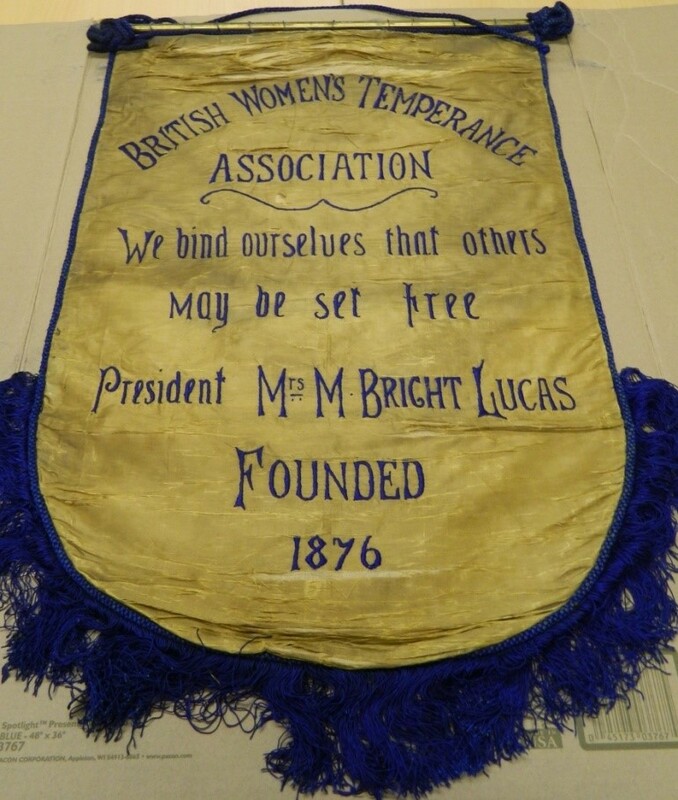 Including the name of the president also tells us that the banner was produced between 1878 and 1890, when Margaret Bright Lucas was in the office. This banner also dates from the earlier days of the organisation. It features a woman dressed in white, holding a banner reading “For God & home & every land”, surrounded by a border of white flowers. 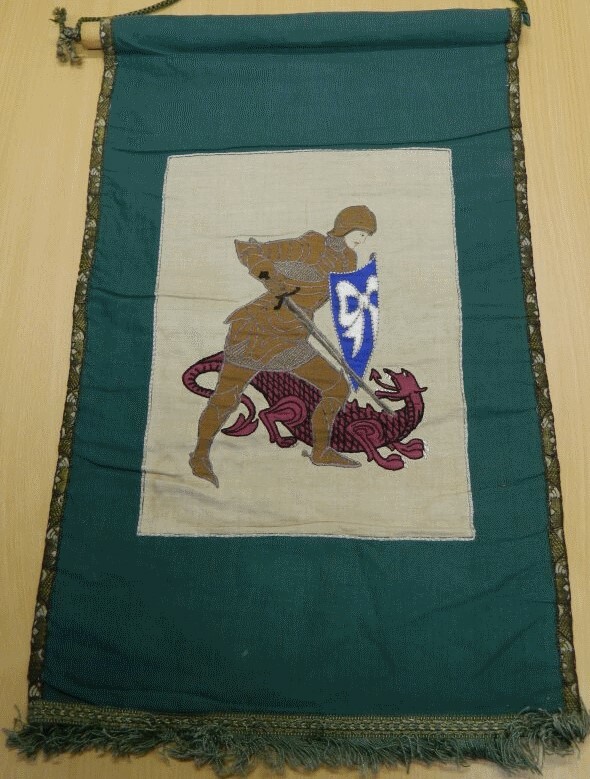 This is one of the more intricate banners in our collection. It is embroidered and appliqued – there is gold embroidery throughout the design, which you can only see close up! We actually have two banners of this design; the other is in much less good condition. This is a banner for the youth department of the BWTA. Although it’s easy to miss at first glance, there is a “Y” integrated into the border above the head of the figure. The “Ys” were members aged 14 to 21 (or so); they had their own groups and leadership and were somewhat independent of the main (adult) BWTA groups. Around the Y, you can see a white ribbon bow. The white ribbon was the symbol of the women’s temperance movement. It was adopted to differentiate the women’s movement from the general temperance movement, which was represented by the blue ribbon. Women in the BWTA (and related organisations) would pin a small white ribbon bow to their clothing to show their allegiance to temperance. The white ribbon became the symbol of both the British and the international women’s temperance movement and is the origin of the name of White Ribbon Association. What do we learn from this banner? At first glance, this banner seems to be about the same age as the Margaret Bright Lucas banner above. The organisation was only called the BWTA until 1893; after that it became the National BWTA and the Women’s Total Abstinence Union. However, even though the name changed in 1893, minute books tell us that members of the organisation were still using “BWTA” to refer to it right through to the 1950s! The slogan on the banner – “For God & home & every land” – also implies that the banner dates later than 1893. This was the motto of the international women’s temperance organisation (the WWCTU) that the NBWTA became a part of – but this happened after the name change! A woman dressed in white is a common feature of artwork of the women’s temperance movement. We have other banners in the archives featuring white-robed and/or angelic women, as well as pledge cards and other artwork. The white robes are often associated with purity. The temperance movement also explicitly linked water with purity. Both temperance and water were therefore in opposition to drink and drunkenness, which was often visually portrayed as dark, dirty and/or immoral. The two banners appear to have had two different uses. One was used as a reward banner for Y branches that had seen the biggest increase in membership in a year. It therefore travelled around the country every year, and became worn. The other banner is in much better condition and would appear to have done less travelling! 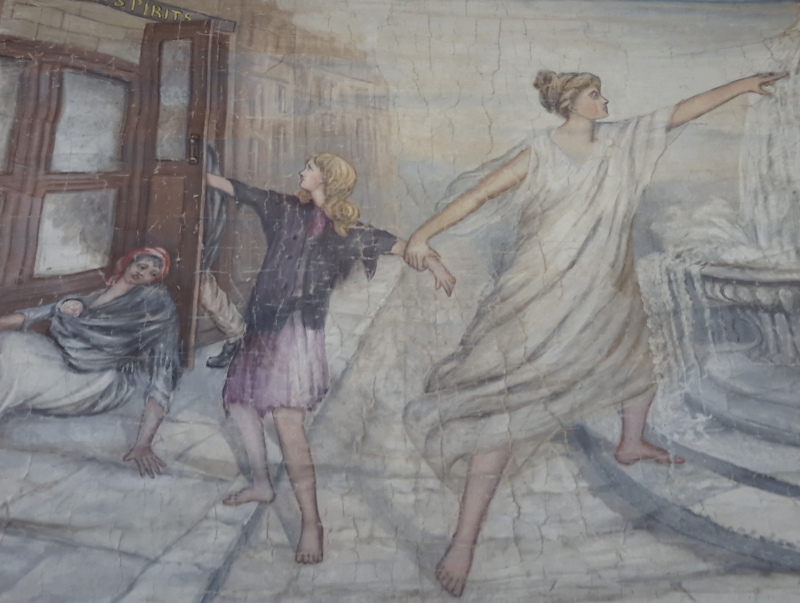 Above: detail from another banner in the White Ribbon Association archives, showing a white-robed, angelic woman (representing temperance) saving a young girl from the public house (shown as decrepit and immoral). Notably the girl is being pulled from the place of drink towards a pure water fountain. This banner doesn’t have as many identifying details – as you can see, it features only an image and no names or text. It is therefore harder to put a date on it, but most of the banners in our collection date from the late C19th or early C20th. Stylistically, it matches with these banners. The banner shows a knight fighting a dragon. The image is a combination of embroidery and applique – some of the embroidery work is extremely detailed! Interestingly, the knight is a woman: the shape of the body and face suggest this, as does the shield she carries, which features the white ribbon of the women’s temperance movement. The dragon the knight is fighting (or dominating, really) represents drink, although it’s not obvious by looking! The trope of drink as a demon or as a dragon savaging the country is quite common in BWTA (and associated organisations) publications and seems likely to be represented here. Parallels were also often drawn with the legend of George and the dragon. We were lucky to recently be visited at White Ribbon Association headquarters by Michelle Harper, a textile conservator. Michelle ran a workshop about how to keep the banners in the best condition possible to ensure their long-term survival. We learned how to clean and pack the banners (including making different shapes out of tissue paper to support the banners!) and Michelle is also working on some of the more dilapidated banners to prevent them from degrading further. As the banners in our collection are so varied and interesting, it is important to keep them protected so they can survive for as long as possible! Some of the banners are 130 years old – hopefully in another century they will still be going strong, telling the story of the women’s temperance movement and representing the women who worked for it.